A feminist close reading of A Woman Tenderfoot can help us gain insight into how Seton-Thompson includes suffragist messages in a text, which, on the surface, seems to be written merely for entertainment. 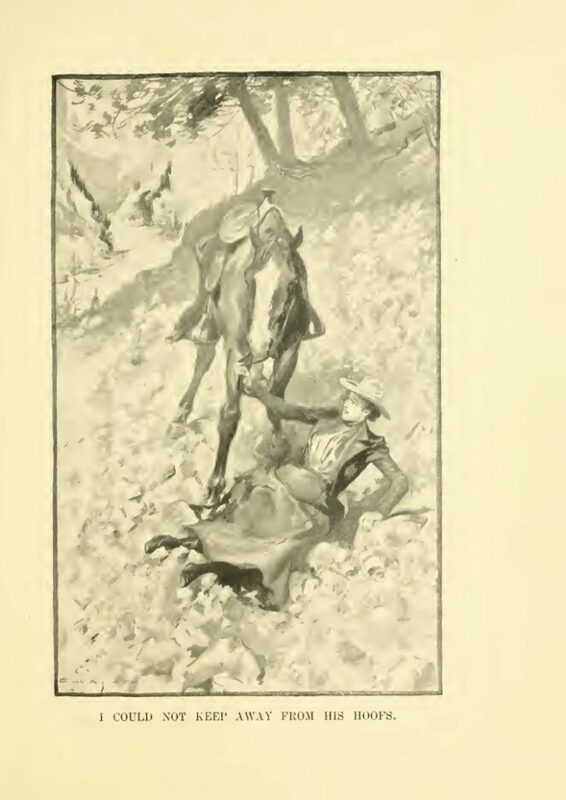 Marginal Illustration by S. N. Abbott, in Seton-Thompson, 22.
that most women say no to camp life because they are afraid of being uncomfortable and looking unbeautiful?” (19). In this rhetorical question, she reminds us of how much the physical mobility associated with camping goes against gender norms for Victorian middle-class women. Virginia Woolf famously critiqued the idea of the angel in the house, which she saw as the oppressive representation of women, often by male authors, according to a Victorian archetype of idealized middle-class femininity (Gilbert and Gubar 22). The angel of the house, associated with domesticity, motherhood, attractiveness, and sexual modesty, was quite opposite to the new woman, associated with freedom from social restraints (Nelson ix). Seton-Thompson provokes her readers here to face their own fears about going against Victorian ideals of femininity by saying, “come with me and learn how to be vulgarly robust” (22). At the time, Theodore Roosevelt, whom the Seton-Thompsons knew personally (MacKethan 181-82), helped to establish the widespread idea that ostensibly masculine physical activities in the wilderness could lead to a form of spiritual awakening (Roosevelt 1). Like other American authors of the day, Seton-Thompson seems to extend American wilderness ideals to western Canada. And like other American women writers (Elizabeth Taylor; Mary Schäffer) and Canadian women writers (Agnes Deans Cameron; Sara Jeannette Duncan; E. Pauline Johnson; Agnes C. Laut) of her day, she seems to extend broader North American wilderness ideals, such as belief in the greater social value of physical mobility, to the new woman. Her use of the term, “vulgarly robust” (22) acknowledges the threat that this physical mobility poses to traditional ideals of femininity while at the same time suggesting the social value of change. As her own adventure is under way, she increasingly describes her physical challenges in the wilderness as performances that involve risk and redemption. When travelling in and around what is now known as Glacier National Park in Revelstoke, BC, she falls while leading her horse next to a precipice. She describes ignoring her husband’s calls while figuring out what to do: “I had the stage, centre front, and it was all I could attend to” (308). Depicting herself with the metaphor of being at centre stage, she reminds us that her physical trial in the wilderness is not just a literal journey, but rather, as Butler would point out, a performance with social significance that would have been of particular interest to her female readers who were witnessing unprecedented shifts in gender norms. She also seems to be performing Roosevelt’s notion of redemptive wilderness survival that was revered by readers of the day, proving to them that women can represent and perhaps access accompanying mainstream ideas of physical and social mobility. And, by explicitly referring to this experience as a performance, Seton-Thompson also seems to have a somewhat tongue-in-cheek attitude about the mainstream roles that she adopts. Rather than just imitating “the masculinist literature of wilderness adventure stories” (Grace xxxviii), she asks us to see this literature of gendered ideals as a performance that is open to ongoing reembodiment and reinterpretation. “I Could not Keep Away From his Hoofs,” by E. M. Ashe, in Seton-Thompson, 309. 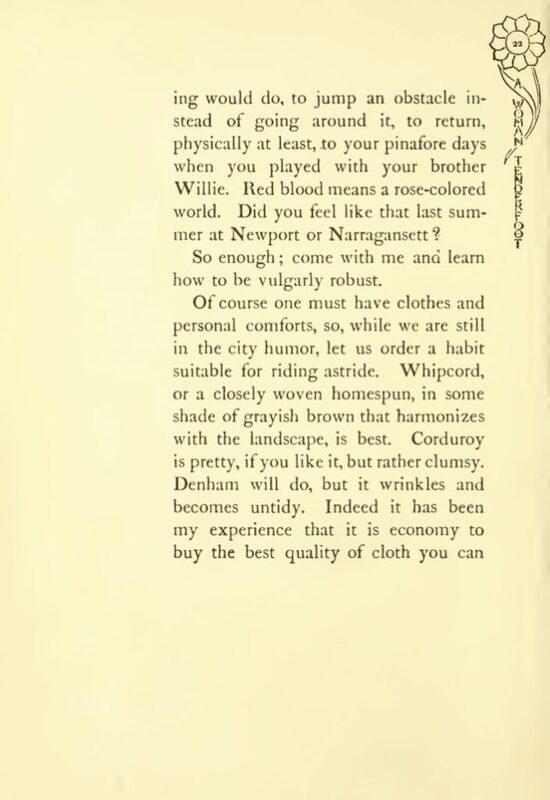 How do you think an average middle-class Canadian female reader, at the time of A Woman Tenderfoot’s publication, might have reacted to Seton-Thompson’s advice to be “vulgarly robust?” (22). How might these reactions reflect on the gender roles and social expectations for women at the time? Can you relate your discussion to Seton-Thompson’s use of the term “tenderfoot”? What types of historical connotations might this term have? How and why does she use it? Why do you think that Seton-Thompson addresses the reader directly? How does this affect the way the text is received by readers even today? Why does Seton-Thompson prioritize discussions of the body and physical movement rather than descriptions of nature? Choose one of the illustrations and analyze it. Expand on the reasons why Seton-Thompson describes her time in the wilderness as a performance. What kinds of specific roles and/or poses does she assume and what accompanying messages are being conveyed in the illustration? Does the illustration seem to match or conflict with the messages she is conveying in the accompanying text? What are some ways that gender expectations have changed in Canada and the United States since A Woman Tenderfoot was published? As a contemporary reader, do you think that Seton-Thompson’s appeal to new woman values is still relevant? What are some examples of contemporary female public figures who combine modes of self-representation with subtly political or activist messages? Gilbert, Sandra M. and Susan Gubar. The Madwoman in the Attic: The Woman Writer and the Nineteenth-Century Literary Imagination. 2nd ed. New Haven: Yale Nota Bene, 2000. Print. Johnstone, Tiffany. “Frontiers of Philosophy and Flesh: Mapping Conceptual Metaphor in Women’s Frontier Revival Literature, 1880-1930.” Diss. University of British Columbia, 2012. Electronic Theses and Dissertations. 14 Oct. 2017. Grace, Sherrill. “A Woman’s Way: From Expedition to Autobiography.” Introduction. A Woman’s Way Through Unknown Labrador. 1908. By Mina Benson-Hubbard. Ed. Grace. Montreal: McGill-Queen’s UP, 2004. Print. Mills, Sara. Discourses of Difference: An Analysis of Women’s Travel Writing and Colonialism. New York: Routledge, 1991. Print. Nelson, Carolyn Christensen. Introduction. A New Woman Reader: Fiction, Articles, Drama of the 1890s. Ed. Nelson. Toronto: Broadview, 2001. ix-xiv. Web. 14 Oct. 2017. Pratt, Mary Louise. Imperial Eyes: Travel Writing and Transculturation. London: Routledge, 1992. 14 Oct. 2017. Roosevelt, Theodore. The Strenuous Life. New York: The Century Co., 1905. Print. Roy, Wendy. Maps of Difference: Canada, Women and Travel. Montreal: McGill-Queen’s UP, 2005. Web. 14 Oct. 2017. Seton-Thompson, Grace Gallatin. A Woman Tenderfoot. New York: Doubleday, 1900. Internet Archive. 2009. Web. 14 Oct. 2017. Smith, Sidonie. “Vehicular Gender.” Moving Lives: Twentieth-Century Women’s Travel Writing. Minneapolis: U of Minnesota P, 2001. ix-xvii. Web. 14 Oct. 2017. Marginal Illustration by S. N. Abbott, in Seton-Thompson, 361. Buss, Helen M. Mapping Ourselves: Canadian Women’s Autobiography. Montreal & Kingston: McGill-Queen’s University Press, 1993. Web. 14 Oct. 2017. Fiamengo, Janice. The Woman’s Page: Journalism and Rhetoric in Early Canada. Toronto, Buffalo, & London: University of Toronto, 2008. Print. Goldman, Marlene. Paths of Desire: Images of Exploration and Mapping in Canadian Women’s Writing. Toronto, Buffalo and London: University of Toronto Press, 1997. Print. L. Higham, and Robert Thacker, eds. One West, Two Myths II: Essays on Comparison. Calgary: University of Calgary Press, 2006. Print. Johnson, E. Pauline (Tekahionwake). Legends of Vancouver. 1911. Vancouver & Toronto: Douglas & McIntyre, 1997. Print. Johnstone, Tiffany. 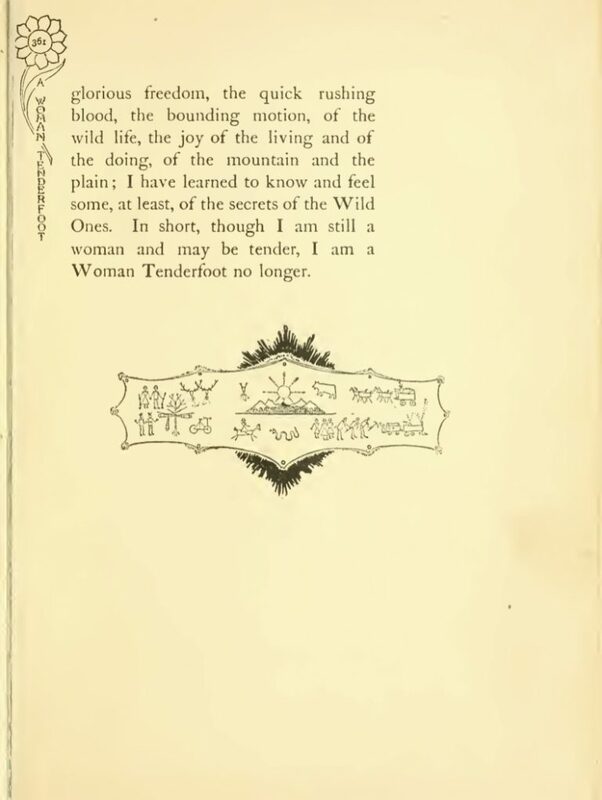 “Grace Gallatin Seton-Thompson: Frontier Adventure Literature and the Dawn of Suffrage.” Women Suffrage and Beyond: Confronting the Democratic Deficit. Ed. Veronica Strong-Boag. 29 Jan. 2013. Web. 30 Jan. 2017. —. “Re-embodying North: A Feminist and Cognitive Linguistics Analysis of Early Women’s Exploration in the Canadian Arctic.” Le lieu du Nord: Vers une cartographie des lieux du Nord. Stockholm et Montreal: Université de Stockholm et Presses de l’Université du Québec, 2015. Droit au pôle Ser. 177-193. Johnstone, Tiffany. “Seeing For Oneself: Agnes Deans Cameron’s Ironic Critique of American Literary Discourse in The New North.” Nordlit 23 (2008): 69-87. Print. —. “Sara Jeannette Duncan.” Oxford History of the Novel in English. V 9. Eds. Ralph Crane, Jane Stafford, and Mark Williams. Oxford: Oxford University Press, 2016. Print. LaFramboise, Lisa N. Travellers in Skirts: Women and English-Language Travel Writing in Canada 1820-1926. Diss. University of Alberta, 1997. Ann Arbor: UMI, 1998. Print. Lang, Marjory. Women who Made the News: Female Journalists in Canada, 1880-1945. Montreal & Kingston: McGill-Queens University Press, 1999. Print. Mount, Nick. When Canadian Literature Moved to New York. Toronto: University of Toronto Press, 2005. Print.